One of the greatest moments in Bravo TV history is when Million Dollar Listing New York is when realtor Fredrik Eklund dumped green tea all over Luis Ortiz after a business deal went poorly. But, while Fredrik's onscreen antics may be hilarious, when he's not at work, he's actually a sensitive guy trying to start a family with his husband, Derek Kaplan. The MDL hubby is an interesting guy — it can't be easy to always be as chill as he is on camera. While Fredrik gets upset about things, particularly when it comes to his work, Derek is always there to remind him that everything will be all right. That zen mentality is just one of the ways that Derek complements Fredrik's high strung nature. Over the last year, a lot has changed for this couple, most notably their decision to have a baby through a surrogate. And, as reported by Us Weekly, they went through a tragic development when their chosen surrogate miscarried twins, setting back their plans for the time being. But, both Derek and Fredrik are determined to keep working on expanding their family. And, since Derek doesn't usually get the spotlight, here's all the things that make him not just a perfect match for Fredrik, but also a genuinely interesting guy. You've seen his art occasionally on Million Dollar Listing, but Derek is a full time artist. His style is as modern as the apartments that Fredrik sells, and you can even buy some of his art from his website if you're interested. According to the above Instagram he posted late last year, Derek has been donating the profits from his art sales to pay for this class of students to go to high school. Clearly, Derek is a generous guy interested in paying his success forward. Derek and Fredrik just traveled to London, where they spent time with Derek's son, Kai, who has also traveled to NYC to spend time with his dad before. He's an adorable kid. According to the biography on his website, Derek was born in Zimbabwe, grew up in South Africa, and lived in London for 15 years before moving to New York City. Fredrik loves to spoil his dachshunds, and Derek is also a devoted animal lover. Look at how snug those two look! According to Variety, Fredrik and Derek just acquired a country estate in Connecticut and, according to the above Instagram post, they'll also be moving into a new NYC apartment with river views (though that killer Madison Square and Empire State Building view will be missed). Fredrik hashtagged the move #NewBeginning, so sounds like the move is a welcomed one. He can be cool as a cucumber on Million Dollar Listing, but also has passion for the important stuff, like his family, his art, and his son — and, possibly, adding more kids to the family. 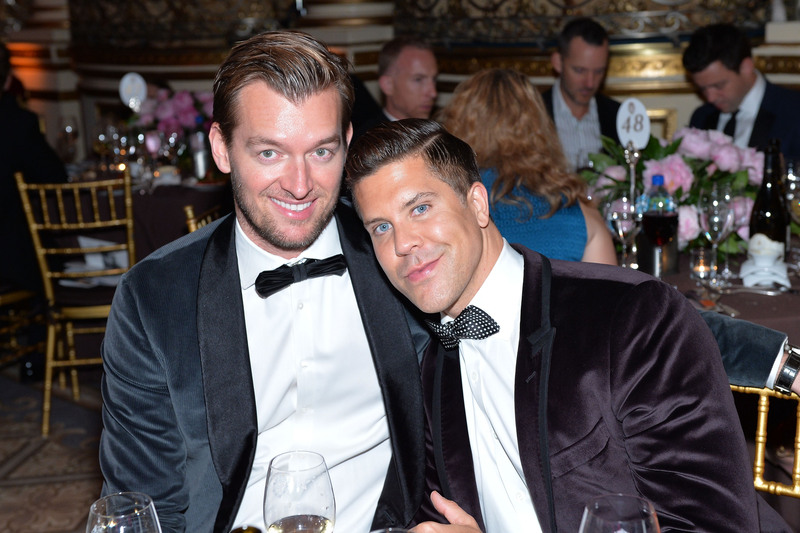 Fredrik is undoubtedly one of the hardest working real estate agents in New York City, but he's also a very lucky guy to be with Derek.